The Princes Risborough WI’s Reading Group discussed Bitter-Sweet Harvest on 5 December 2012. Chan Ling went to meet the Group and spoke about the inspiration for her book. Chan Ling was invited to Henton, Chinnor on 18 October 2012 to participate in the Book Groups’ review of Sweet Offerings. She gave a talk on the background and inspiration for the book and introduced her new novel, Bitter-Sweet Harvest. The Writer’s Tale by Chan Ling Yap, WI Life Magazine, Issue 47 October 2012. Bitter-Sweet Harvest “…a superbly told love story that will tug at your heartstrings…. “ For the full review in Choose and Book visit: Choose and Book: Bitter-Sweet Harvest by Chan Ling Yap. 1 September 2012. Chan Ling attended the Society of Authors and Writers Oxford Summer Party on 26 July 2012. Chan Ling attended the Longwick W.I Readers’ Group literary lunch on 25 July 2012 when they reviewed Bitter-Sweet Harvest. She gave a talk on the background and inspiration for her book. Whichbook recommends Bitter-Sweet Harvest. For more information visit Bitter-Sweet Harvest by Chan Ling Yap. See also some of Chan Ling’s favourite books in Whichbook Guest Lists. 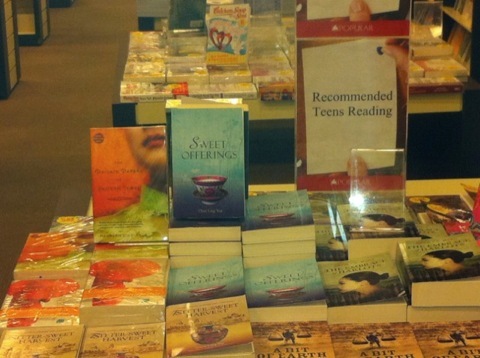 Chan Ling met with readers and booksigned in Waterstones Witney on 7 July 2012. Bitter-Sweet Harvest has been nominated for the Popular Reader’s Choice Award. For more information and to vote go to http://bookfest.popular.com.my/readerschoiceawards/index.php/vote/group/0 The closing date is 1 July 2012. Chan Ling’s interview with S. Bissme, the Sundaily, 23 May 2012. “Malaysian author Yap Chan Ling features a black moment in our country’s history in her second novel, Bitter-Sweet harvest……..one wonders if she had based her novel on her own experience”. Chan Ling chatted with readers at Meet the Author event in Waterstones, Friarsquare, Aylesbury, on 7 April 2012. 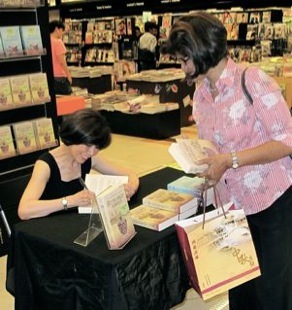 Chan Ling recently visited Malaysia where she was invited to appear on NTV7’s popular morning programme Bella (episode 21) and a book-signing at the Times in the Pavilion, Kuala Lumpur. 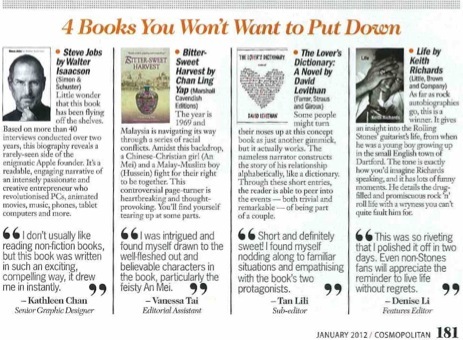 Cosmopolitan Singapore lists Bitter-Sweet Harvest as one of “Four books you won’t want to put down”. Interview with Chan Ling by Susan Abraham – see Reviews.